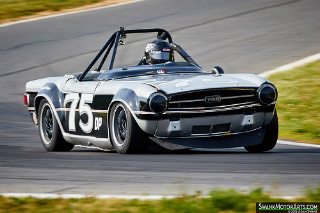 The Triumph TR6 sports car. In 1969, the TR6 was launched, and was seen, by many, as the last of a breed of British classic cars, and a worthy successor to the Austin-Healey 3000, which was phased out in 1968. Before the inception of the TR6, Standard Triumph wanted the body styling of the TR4 and TR5, originally the work of Michelotti back in 1961, to be brought more up-to-date. The result was that the redesign of the forthcoming TR6 was given to the German company Karmann, famous for their work with VW, Porsche and BMW. 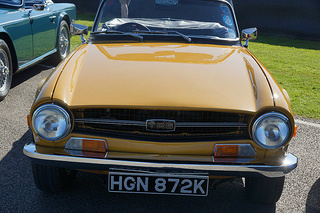 The outcome was that, since the chassis, centre section, doors, and running gear of the TR6 were, essentially, the same as those on the TR4A, TR5 and TR250, these would be retained. The only changes were that the front and rear sections were squared off, and the boot space was increased. This form of body styling was commonly known as the "Kamm-style tail", and was very common in the design of cars throughout the 1970's. It is interesting to note that the original tooling was now held by British Motor Heritage, who can supply body panels, or even a complete bodyshell. 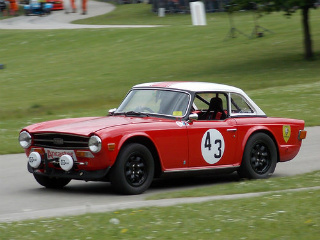 For the UK and European markets, the TR6 sports car used the same engine as the TR5, which was a 2.5 litre, in line 6-cylinder, Lucas fuel injected unit. Up to around the latter part of 1971, the power output from this engine was 150 bhp, which was more than a match for that developed from the last of the 3 litre Big Healey's. However, from that time to 1976, when production ended, the PI engine was detuned to 125 bhp due, apparently, to problems experienced in the stop-start of town traffic. 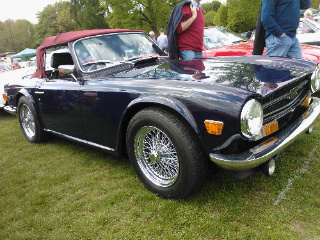 This was achieved by using a different camshaft, and altering the metering of the fuel injection, which made the TR6 smoother and more flexible. 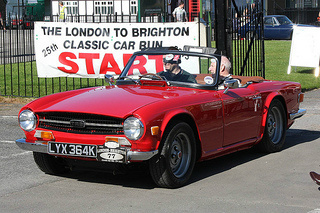 In terms of the US market, the TR6 US variant continued in the same format as with the TR250, with two Stromberg carburettors replacing the fuel injection, and therfore developing only 104 bhp. The need for a US variant at all was down to the fact that the Lucas fuel injection system did not meet US emission control regulations. Both the TR6 and TR6 US variant of this period were still, basically, two door, two seater convertibles. The TR6 featured a four speed gearbox with synchromesh on all forward gears. An optional Laycock-de-Normanville overdrive, activated by a switch, operated on the top three gears in early models. In later models, this was limited to the top two gears since there was a tendency for the gearbox to fail, when in second gear, at high revs. 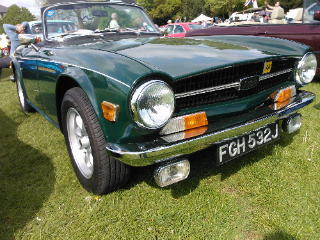 Apart from some technically advanced features, the TR6 was still, basically, an old fashioned sports car. The body was bolted onto the chassis rather than there being a single, unified (monocoque) structure. With 94, 619 TR6's built, only 8,370 were sold in the UK (as PI's), the remaining 86,249 being exported (at least 78,147 as the carburettor version, and 5,333 as PI's). Many regarded the passing of the TR6 as the end of an era. 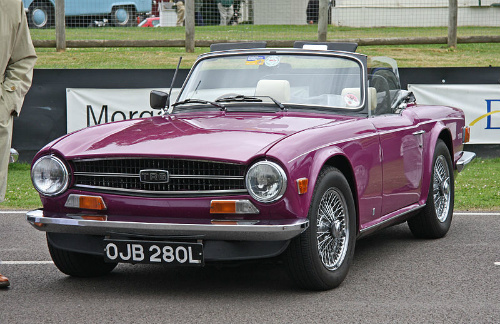 A 1969-76 Triumph TR6, in good condition, would fetch anything between £11,000/$18,000 and £15,000/$24,000, whilst an outstanding example, including the highly desirable 150 bhp model, would command anything between £20,000/$32,000 and £25,000/$40,000, with a TR6 in showroom condition would be worth around £35,000/$56,000.